Transportation needs are easily met in the Greater Clinton Region. As the closest point in Iowa to Chicago, we offer access to domestic and global markets without the congestion and delays associated with a major metro. The ports in our region that offer direct access to the Mississippi River are proven to be the most efficient, and have easy access by both rail and interstate. The Union Pacific northern mainline cuts directly through Clinton. We are surrounded by quality highways and interstates, particularly Interstate 80, which functions as a main artery connecting the region to the east and west coasts. Air travel, both commercial and domestic is provided by several airports, including the Clinton Municipal Airport, Quad City International Airport and Dubuque Regional Airport. The Clinton Municipal Airport is a public uncontrolled airport owned by the City of Clinton. 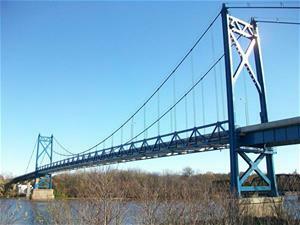 It is conveniently located directly across from the newly developed Lincolnway Railport. The Lincolnway Railport is now home to two major businesses. One of which is a European based concrete railroad tie manufacturer RAIL.ONE.